Clifton is one of the oldest and most affluent areas of the city, much of it having been built with profits from tobacco and the slave trade. 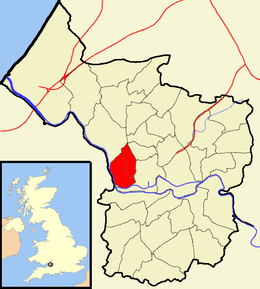 Situated to the west of Bristol city centre, it was at one time a separate settlement but became attached to Bristol by continuous development during the Georgian era and was formally incorporated into the city in the 1830s. Grand houses that required many servants were built in the area. Although some were detached or semi-detached properties, the bulk were built as terraces, many with three or more floors. One famous terrace is the majestic Royal York Crescent, visible from the Avon Gorge below and looking across the Bristol docks. Berkeley Square which was built around 1790 is an example of Georgian architecture. Secluded squares include the triangular Canynge Square. The ABC Cinema on Whiteladies Road was converted into offices and gymnasium in the 1990s but there are now plans to re-open it as a cinema. Clifton Lido was built in 1850 but closed to the public in 1990, it was redeveloped and opened again to the public in November 2008. 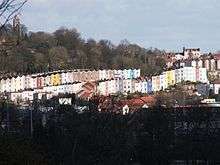 Clifton has a long history of natural history television programming and global conservation, due to the presence of Bristol Zoo in the north of the ward and the proximity of the BBC Natural History Unit, which means that more than 25% of the world's wildlife programmes are made in Bristol. Animal Magic with Johnny Morris was filmed at Bristol Zoo for the duration of the programme (1963–1983). A medieval Jewish ritual bath, known as a mikveh, was discovered in 1987, in the former Hotwells Police Station bicycle shed, by the Temple Local History group. This is believed to be the origin of the name Jacob's Well, also given to the adjoining road. ↑ "Clifton" (PDF). 2011 Census Ward Information Sheet. Retrieved 26 February 2015. 1 2 "Super Output Areas(lower level)- Clifton" (PDF). Bristol City Council (citing ONS). Retrieved 23 April 2007. ↑ "Clifton East Ward Map" (PDF). Bristol City Council. Retrieved 16 June 2006. ↑ "Relaunching the Whiteladies Picture House". Clifton Conservatives. 17 April 2012. Retrieved 1 May 2012. ↑ "Suburb's Victorian lido reopens". BBC News. 24 November 2008. Retrieved 30 November 2008. ↑ "Charles Lucas: Boyces Avenue – people, cars or both?". Clifton Conservatives. 23 March 2012. Retrieved 1 May 2012. ↑ "Clifton Ward Profile" (PDF). Bristol City Council. Retrieved 16 June 2006. ↑ "Clifton East Ward Profile" (PDF). Bristol City Council. Retrieved 16 June 2006. ↑ Nield, Anthiny (25 February 2013). "Film Reviews: People Like Us: Some People Reappraised". The Quietus. ↑ Emanuel, R. R.; Ponsford, M. W. (1994). "Jacob's Well, Bristol, Britain's only known medieval Jewish Ritual Bath (Mikveh)" (PDF). Transactions. Bristol: Bristol and Gloucestershire Archaeological Society. 112: 73–86. ↑ "Clifton Ward Map" (PDF). Bristol City Council. Archived from the original (PDF) on 22 November 2009. Retrieved 16 June 2006. ↑ Ordnance Survey (2005). OS Explorer Map 155 – Bristol & Bath. ISBN 0-319-23609-9.